Feedback is vital to our ongoing development, it clarifies expectations, helps people learn from mistakes and it builds confidence too. Some feedback is easy, it’s often a pleasure to tell someone they’ve done a good job, congratulate them on achieving a target, or tell them how much they are valued by the rest of the team. The feedback we like less (offering or receiving it) is the difficult conversation about behaviour. We sometimes avoid it or to try to soften it; this inevitably leads to the unwanted behaviour not being addressed, we can then find ourselves dealing with a trickier situation later. So who’s job is it to give feedback? The Boss, a Supervisor – or maybe it’s everyone’s? Our half day interactive workshop helps teams understand why ongoing, proactive feedback is essential for effective team working; it explains how it works and gives helpful tips on how to do it well. There is even an opportunity for everyone to receive motivational feedback too. This workshop has been created to work as a ‘stand-alone’ opportunity, or one that can be followed by one of our fantastic events, allowing you to put then theory into action and have fun too! 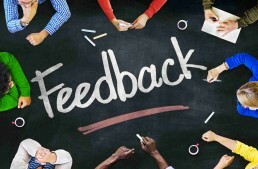 We use a well-respected feedback framework to create an outline for this workshop, designed to meet everyone’s needs. We never use ‘off the shelf’ content as we always prefer to talk with you to understand what you want to make better – and why. For this topic, we will ask you about your existing culture, to support the design of your unique session. This makes it more likely that the experience will be understood and agreed by everyone and that you’ll begin to see people use feedback more often and more effectively soon afterwards. How can a Feed Forward workshop benefit my team?